We've been talking about streetcars for years, but on Friday night, one finally hit the tracks in Northeast D.C.
Crews hauled a single streetcar from a testing facility in Anacostia to H Street NE between 3rd and 5th, where it was used to test the new tracks in what's become a booming neighborhood for the city. H Street NE between N. Capitol and 5th streets will be closed in both directions between 7 p.m. Friday and 1 a.m. Saturday. (Scroll to bottom for full list of detours.) Pedestrian access will not be affected by the closures. 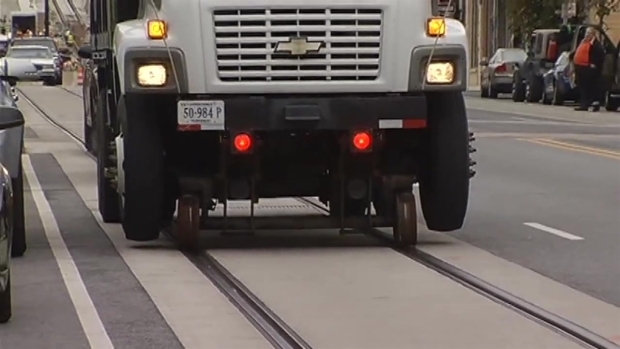 It's been years in the making, but Friday, a streetcar will be placed on the streetcar tracks on H Street in Northeast. 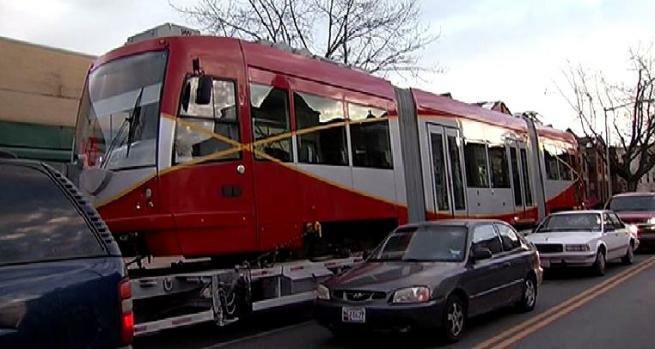 The DC Department of Transportation says it will move a streetcar from its testing facility in Anacostia to H Street. On Saturday or Monday, testing will start to get the streetcar ready for service on H Street. 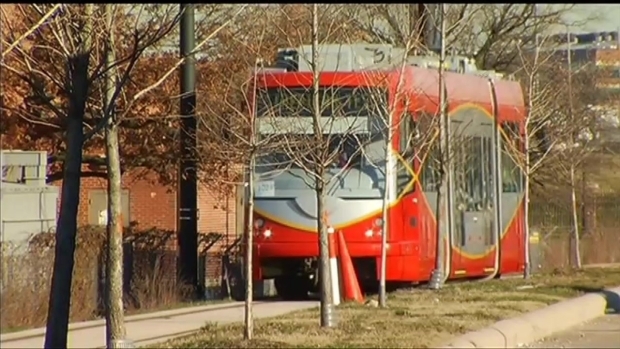 The streetcars will begin carrying passengers in early 2014 along a two-mile stretch along H Street and Benning Road. "Turnaround" tracks are in place north of Union Station, and traffic signals along the route will control the flow of traffic and streetcars. "I think it's a good thing. It's going to be a little congested, though, I think, but it's a good thing," said Olayla Ruffin, who lives near H Street. "It will attract a lot of people to this area, because we need that." The tracks have been laid in place on what was once one of the city's bumpiest streets, but has now been reconstructed, and overhead power lines are ready to provide electricity to power the streetcars. 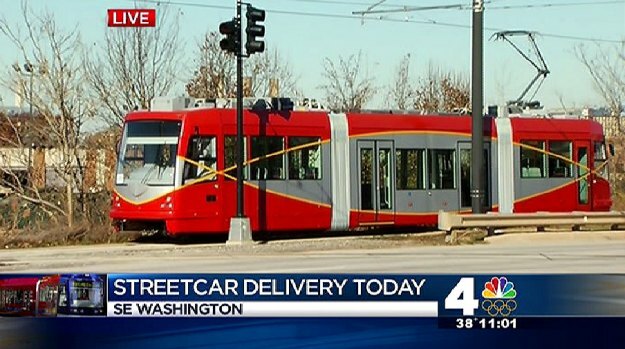 News 4's Transportation Reporter Adam Tuss looks at preparations for moving the city's first streetcar from the testing site in Anacostia to the new tracks along H Street NE. 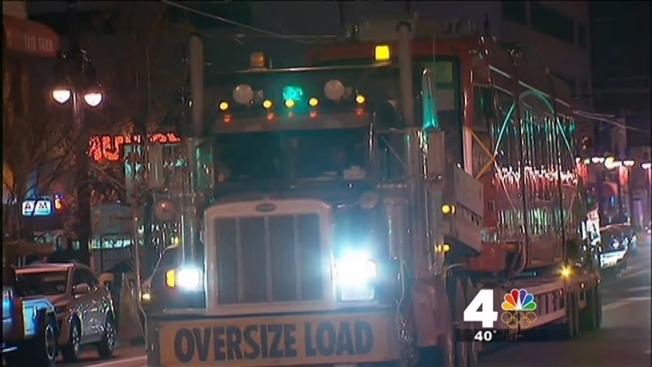 Crews began testing them at a facility in Anacostia in early May, but once they hit H Street, it'll be a different story as they mix with the real world. Drivers and pedestrians will have to get used to sharing the road with streetcars, something many of them may have never done before. While many other cities have streetcars, the D.C. area hasn’t seen them in half a century. 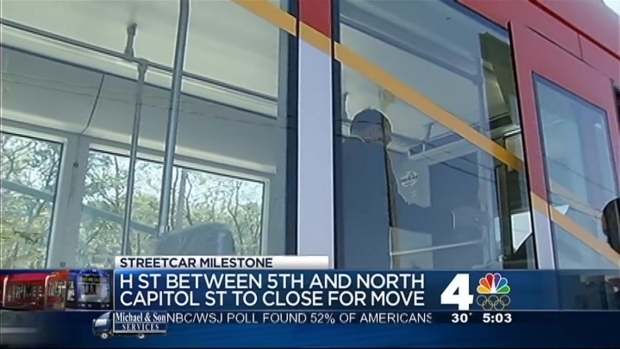 News4's Tom Sherwood reports on the District's first streetcar and its move to the new tracks on H Street NE. Before that, though, streetcars ran throughout the district and its suburbs for about a hundred years, from 1892 to 1962. "The attitude at the time [when they were phased out] was that streetcars were slower than buses; they weren't as flexible as buses," said Eric Madison, a trustee with the National Capital Trolley Museum in Colesville. The rides also tended to be shaky, because streetcar drivers didn't steer the cars as they ran the tracks; they could only power them on and off. The newer cars are designed to ride more smoothly. The city's first streetcar in half a century will hit the tracks on H Street for testing Friday evening. Madison said earlier this year that he believes they will spur economic development by connecting communities. The H Street corridor in particular has seen astronomical growth and skyrocketing real estate prices as the neighborhood has become a popular dining and entertainment destination just a couple miles east of Union Station. The cars are styled to resemble the city's Circulator buses: bright red, with a gray and yellow double helix. District officials want to have streetcars eventually running all across the city. Across the river, Arlington is also gearing up to welcome streetcars to Columbia Pike and Crystal City. How did people get around back in the days before Metro? News4's transportation reporter Adam Tuss takes us to the National Capital Trolley Museum in Colesville, Md., to see the history of streetcars and how the city is reviving them.